Published on April 21, 2015 in analytics, general info and trends. Closed Tags: Cape Cod condo sales, Cape Cod Luxury condo sales, Cape cod real estate sales, Cape Cod sales, Provincetown condominiums, Provincetown luxury homes, Provincetown real estate, Truro Real Estate, Wellfleet Real Estate. What a first quarter! Blizzards, arctic winds, record snowfall – it seemed like it would never end. But finally, spring is here! It’s tough to identify trends in the first quarter with such a small sampling of information. Especially for a quarter rocked by historically severe weather. Yet with that said, first quarter results were surprisingly strong – a sure sign that demand remains high! For the most part, sales and prices have shown moderate gains and with warmer weather sure to come, the energy is right for a solid spring market. In Provincetown there were 22 condominium sales in the first quarter vs. 24 last year. 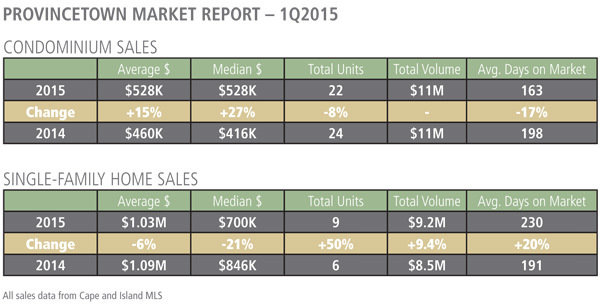 The median sales price was up 27% to $528K and the average sale price was up 15% to $528K. Sales volume was even with last years at $11M. The average price per square foot for condos sold was $563, up from $500 per square foot in the 1st quarter of 2014. There are 82 condos on the market with an average asking price of $590K and average price per square foot of $666. The average sale price for a single-family home was down 5% to $1.03M from $1.08M. The number of single-family home sales in Provincetown increased by 50% to nine from six last year. There are 40 single-family properties on the market with an average asking price of $1.37M. There is still a shortage of inventory in this category that continues to have a direct impact on sales numbers. Provincetown continues to lead the way on the Outer Cape with higher prices and a higher sales volume. It continues to attract international buyers as well as buyers from around the country who have visited over the years and who now want to have a home here. We expect that the late spring will create a rush of buyer interest and range of new properties for sale. This delayed spring market coupled with consistent and pent up demand, as well as continued low interest rates, creates an historically opportune time for homeowners to sell. The average sales price for single-family properties in Truro was up 26% to $922K from $733K in 2014. However, the median price was down 12% to $626K. The number of sales was up from eight to 10 this year. Currently,there are 103 single-family properties on the market with an average asking price of $891K. 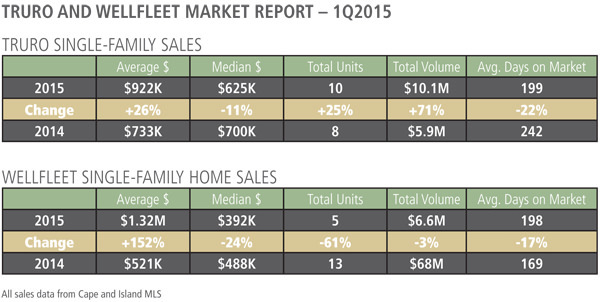 In Wellfleet, the average sales price of single-family properties increased dramatically. The reason for this sharp increase was due to the sale of 95 Granny Treats Road – a single-family home that sold for $5.1M – that skewed averages much higher. The number of sales decreased by more than half to five units from 13 in 2014. There are 48 single-family properties on the market with an average asking price of $954K and a median asking price of $601K. Wellfleet is predominantly a single-family sales market as well. Even with the severe weather this winter and a shortage of inventory in some categories, we continue to see increased prices and sales numbers on the Outer Cape. This illustrates a very resilient market and strong buyer demand. Please call or stop in if you are thinking of buying a home or selling your existing home, or if you are just curious to see what your home is worth. Our business philosophy has always been that the best-informed buyers and sellers are the most satisfied with their results. And that’s what we do best.